Antique Boat Center On Facebook, and Twiiter. Now finding a place to repair, restore, buy or sell an antique or classic boat is fare from the old antique way of snail mail and just word of mouth. 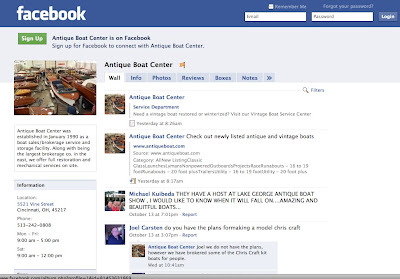 Antique Boat Center one of the leading places for such things is stepping up it’s game with a great Facebook page and you can follow on Twitter and get this, see boats being worked on on a web cam on the home page. It’s great to see it being done well, then again the guys there do everything well. Click here for the facebook page or here for the Antique Boat Center home page or here if you don’t know what Twitter is. …. "or here if you dont know what Twitter is." Veeery good Matt, very good. OK!!! You made me look too. Dang!! !